Rhiannon:23269 wrote: Oh wow, you DID? Can't wait! bobby88:57814 wrote: I just watched this earlier today and it was excellent. In my opinion, it seemed like a commentary on how society tends to look down on people who are different, and Johnny played the part of Billy beautifully. That mugging scene was hard to watch, but you know what I found even more unsettling? When Billy tells the cashier at the concession stand that he just got into "one hell of a fight" and has obvious bruising on his face to prove it, the cashier just deadpans "That'll be 26¢." as if he didn't say anything at all! Not "Are you okay?" or "Do you need me to call for help? ", just gave him his total. That's cold and sadly, probably not terribly uncommon. 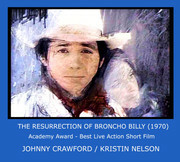 I also enjoyed Bronco Billy and it was the best thing Johnny did after Rifleman. I’m going to go watch that again. starring Clint Eastwood and Sondra Locke.